OK so I've been super busy with school and work that I haven't had time to post anything new in a long time! Two weekends ago was the University of Texas Graduation. My boyfriend and alot of my other friends were graduating so I decided to make them cupcakes for their gifts. 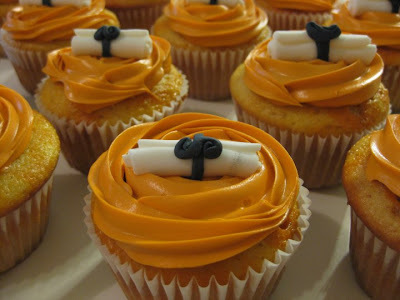 I wanted to make the diplomas out of fondant, so I search online and I found my new favorite love. The All in One Bake Shop. This place was my heaven! While I was there I bought a small tub of fondant, and orange, brown, and black food coloring. To make the little diplomas, I rolled out a small portion of the white fondant, and then used a pizza cutter to make small rows. I then rolled them like you would a piece of paper. I then took another small portion of the fondant and dyed it black. I then rolled those into little rows like spaghetti, and then wrapped them around the diplomas to look like bows. To make the cupcakes I used a box of yellow cake mix. Before i pored them into the cups I took out half of the mixture and dyed it burnt orange with the brown and orange food coloring. I alternated pouring in the cake mix to give it a little spiral effect. 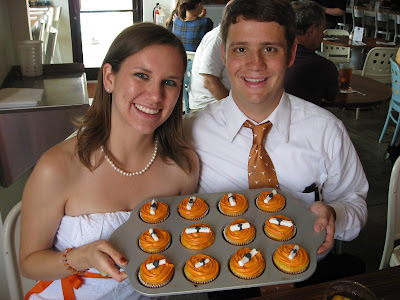 Finally I dyed a tub of vanilla icing burnt orange and used a piping bag to decorated the cupcakes. 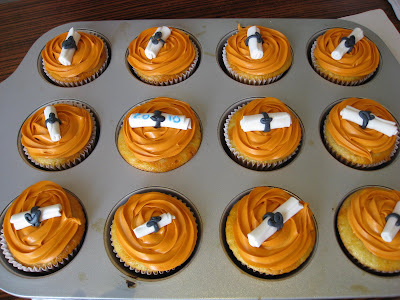 I topped them with the mini diplomas and they were a huge success! !